Do you find that when you go through a loaf of bread the crusts continuously get overlooked? It's like they act as protectors for the slices between them. By the time you get to just the crusts they're too dry to do much with except of course to turn into breadcrumbs. I use a hand blender for blitzing the crusts. The breadcrumb coating is perfect for these turkey steaks. On their own they can be a little bland and dry but the flavoured coating gives them that much needed boost. 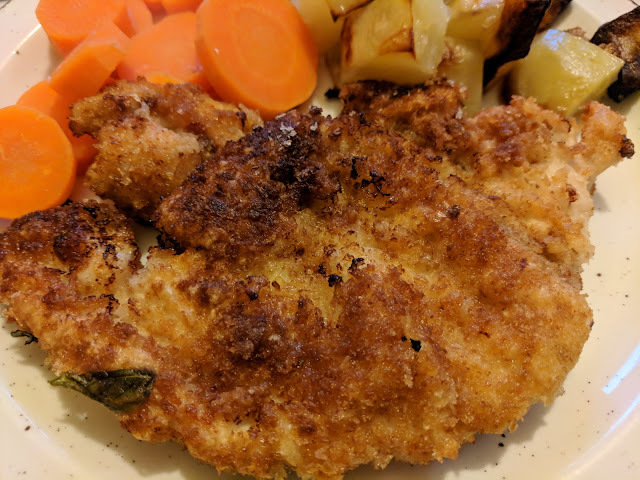 If you are frying the steaks then the breadcrumbs work best when they are toasted just to crisp them up a bit. I do this in the oven and at the same time heat some oil for the potato accompaniment. Equipment: Hand blender, lemon zester or grater, 3 shallow bowls, large frying pan. 1. Heat the oven to 180°C/Gas mark 4. 2. Lay the breadcrumbs on the baking sheet so they are all in a single layer. 3. Bake for a around 5 minutes until they feel dry and slightly crispy. 4. Put into a shallow dish and then mix in the lemon zest and torn basil leaves. 5. Lay out the flour, then the egg followed by breadcrumbs all in shallow dishes. 6. Start heating the oil in the frying pan. 7. Dip one turkey steak first in the flour on both sides, then coat in the egg before finishing with the breadcrumbs. 8. Place into the heated oil and fry on each side until the turkey steaks are cooked through.